Lilly was Spanna's friend. 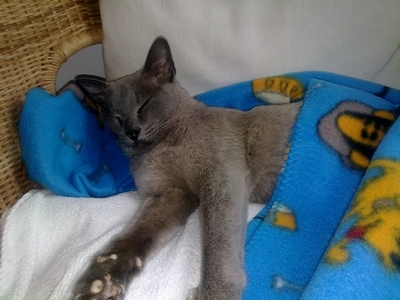 She was a beautiful blue burmese cat. Spanna was 7.5 years old when Lilly arrived to join us. They were great friends and Lilly used to snuggle up with Spanna in his bed. She would try and burrow underneath his fur as he was warm. Lilly is in various photographs on this website next to Spanna. When Spanna died she seemed very confused and tried to look for him, she sat on the fence for days just waiting. It was over 2 years before we felt ready to have our next dog "Reggie" and Lilly was nearly 4 years old. She became good friends with Reggie. They would share great fun fights between child stair gates with Lilly teasing him as she could pop quickly through the slats of the gate after she had encouraged him to chase her. She is also in various photographs with Reggie on this website. 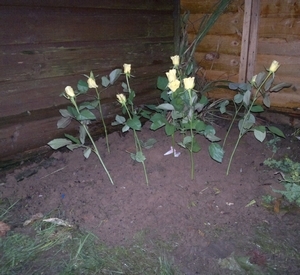 Sadly in November 2011 having been a very fit and agile cat she suddenly appeared unwell. 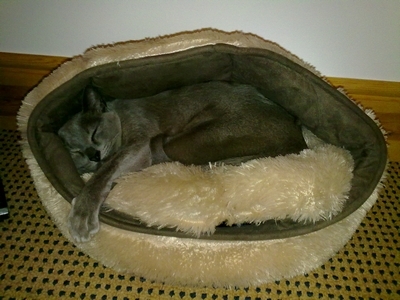 I took her to the vets and they did an x-ray and ultrasound scan on her and found she had a huge tumour on her lungs. The tumour was compressing her trachea and was making it uncomfortable to breathe, eat and drink. It was very far advanced and it was causing other complications too. Due to the poor state that Lilly was in and the fact that she was deteriorating so very quickly we took the painful decision to have her PTS. We were totally unaware of Lilly being ill until those few days before she was diagnosed. Lilly had always been very fit and healthy, and although in her last few years had enjoyed sleeping for long periods of time she was still an incredibly fit and agile little cat who still enjoyed to play as if she were a little kitten, and would still have those crazy mad half hours that they like to have racing around the house. Lilly gave us 13 wonderful years of pleasure, and melted the hearts of all those who met her and is very much missed by us all. Lilly really was a special cat whom we all loved very much. 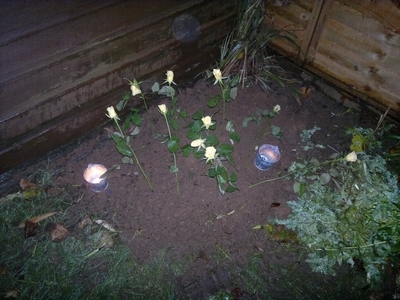 She now has a special place in our garden, and will forever be in our hearts.